When fish get sick, many hobbyists assume the main culprit is a disease-causing organism and immediately reach for a drug or chemical to put in the water. But the solution is not that simple and just adding products to the water without any testing or “big picture” approach can lead to disaster! All aquarium keepers should be aware of parasites, bacteria, viruses and fungi (disease-causing organisms, or pathogens) that can sicken or kill your fish. 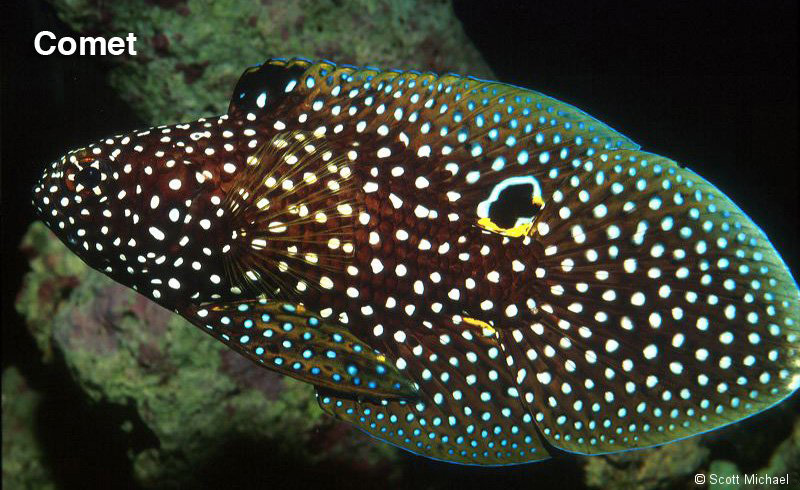 Certain pathogens infect a wide variety of saltwater fish, while others affect only some species. 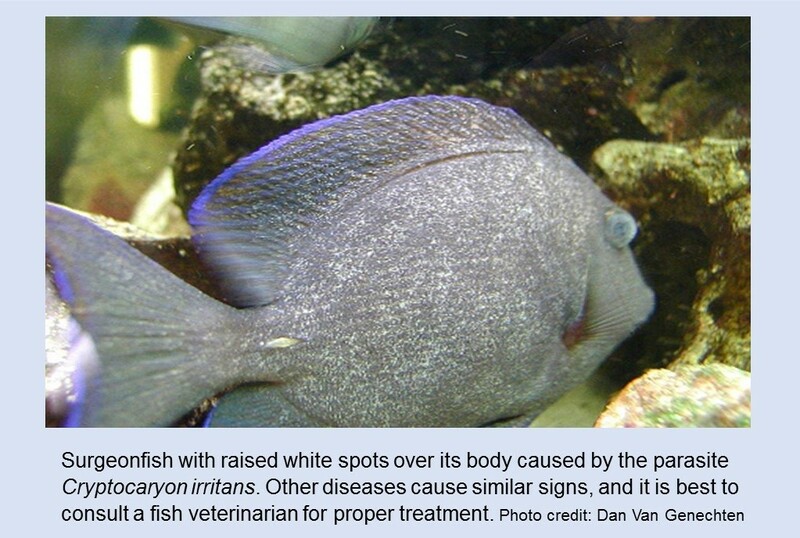 The presence of these pathogens does not necessarily mean your fish will become sick. In fact, poor water quality is often the main problem, so understanding water quality is one major key to keeping your fish healthy. In most cases, disease is the result of three overlapping events: 1) just the right load of pathogens in the tank, 2) a fish that is susceptible to those pathogens, and 3) some form of stress, often related to an environmental problem (such as too much ammonia in the water or a sudden change in temperature), that weakens the immune system, predisposing the fish to illness. The saltwater aquarium hobbyist can follow the lead of professional fish farmers and researchers in preventing disease by managing the things that stress the immune system as well as minimizing the chance that parasites or diseases find their way into your tank. Temperature: Most saltwater fish are from tropical regions with fairly stable temperature ranges and do not tolerate cool water or even very warm water. Check the temperature of your aquarium regularly to make sure the heater is adequate for the size of your tank and that its location doesn’t cause temperature extremes (near a heating or cooling vent, or right by a window in direct sunlight). Sudden changes in water temperature can weaken the immune system, particularly a rapid drop. Match the tank temperature when replacing water. Poor water quality: Fish heath depends on adequate oxygen in the water (dissolved oxygen), low ammonia levels (see The Nitrogen Cycle), proper pH (a measure of acidity), and alkalinity (a measure of buffering compounds like carbonate and bicarbonate that prevent dangerous changes in pH). Overcrowding and overfeeding can lead to the buildup of ammonia and organic matter that may lead to a lack of dissolved oxygen. A good filtration system is essential for removing waste products from your fish along with uneaten feed. It is also very important to make sure that your biofilter has been properly cycled and can handle the ammonia being produced in the tank. If the level of buffering compounds in the system drops too low, the filtration system will not work properly. Fish also have a preferred range of pH (acidity). Be sure to have your water tested regularly, and especially during start up and whenever problems arise. Osmoregulation: Fish, like people and other animals, need to maintain the proper balance of salt compounds and important elements (including sodium, chloride, and calcium ions) to maximize health. Any disturbance to this balance, whether by poor water quality, physical damage, or infection, can lead to disease. Handling: The mucus coating, produced by special cells in the outer skin and gills of fish, is a primary defense against disease. Any activity that disturbs this layer increases the chance of infection, so your fish should be handled as little as possible. If you have to move fish while maintaining your aquarium, make sure their temporary holding facility has smooth surfaces. Also, because scales of fish are actually embedded under a layer of skin cells, removal of scales can lead to “holes” in the fish’s skin, leading to problems with salt and water balance and possibly infections. Generally, fish that you purchase will be healthy, but simply moving them from the store to your aquarium is a stressful experience. The water quality and temperature of your tank may be different than the shop’s, so it is important to “temper” your new fish before releasing them. If the trip from the store to your home is relatively quick (less than an hour so that there is minimal ammonia produced in the bag and pH has not changed too drastically), place the unopened bag in your aquarium for 15-30 minutes until there is no difference in water temperature. Open the bag, add an airstone, and slowly add tank water to even out any differences in pH. Ideally, you should not allow bag water to enter the tank. Instead, after at least equal amounts of tank and bag water have mixed, gently scoop the fish out of the bag with a soft net and place it into your tank. If your trip is longer than a few hours, higher concentrations of ammonia can build up in the water and pH may change more. In these cases, ask the store to put your fish in a larger bag and plan on tempering your fish for at least an hour. If your fish have trouble swimming upright or appear stressed during the trip, you may have to add ammonia remover, available at pet suppliers. Rather than stocking your tank all at once, add a few fish at a time and observe them for several days to make sure they are healthy. As your tank matures, check your water quality regularly (especially ammonia, nitrite, and pH), and consider using professional bio-security practices when adding fish. Fish farms and research facilities isolate new fish in a separate tank, typically from 2-4 weeks, to ensure they are not sick and to make sure they are eating properly. Although infection with some fish pathogens results in visible signs, many are difficult to see with the naked eye. The best way to spot early disease is to look for changes in behavior: lack of appetite, unusual swimming, loss of balance, remaining in a particular part of the tank (fish with gill or skin parasites may stay near the surface or near aeration, or may “flash” (scratch their bodies against a surface). Also look for changes in appearance such as change in body shape, sunken gut, distended gut, bloody areas, “pop-eye”. For some external parasites, the fish’s body shape may be normal but there may be spots or other signs of damage on the fin, skin, or gills, such as increased mucus production (a lighter or whitish/grayish “sheen”), fraying or hemorrhages. Properly diagnosing and treating pathogens in tropical saltwater fish is difficult for the beginner and is challenging even for more advanced hobbyists. Parasites are often not visible to the naked eye, and bacterial, fungal, and viral diseases are confirmed through complex laboratory work. Different pathogens can cause similar signs of disease and behavioral changes, which may be the result of water quality problems alone. Treatments are often specific to a particular disease agent, and in some cases treatment targets a particular life stage. 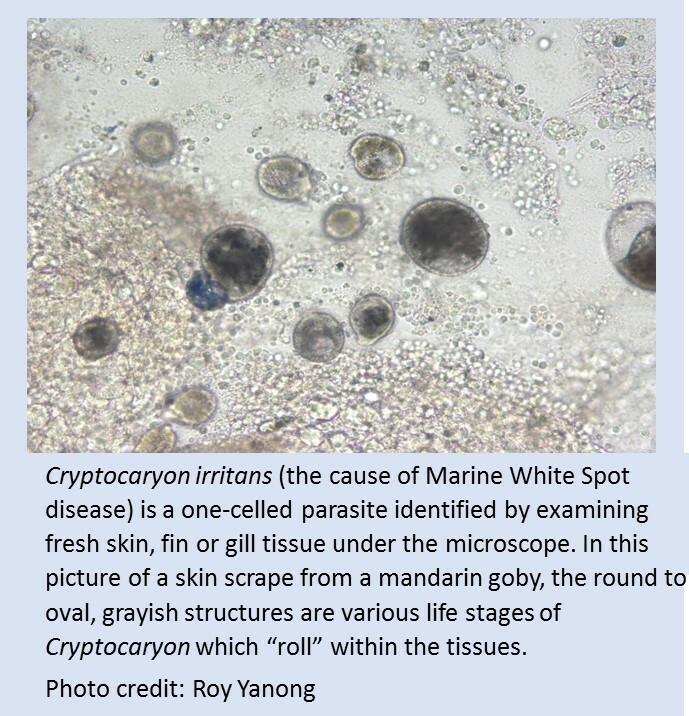 For example, Cryptocaryon, an important marine fish parasite that causes “white spot” disease in saltwater species, has several life stages, including some that are covered with a protective cyst and are more difficult to kill; however, the free-swimming, infective life stage known as a theront is much more susceptible to treatment. As in human health, choosing the right drug, and proper dosage and duration are critical. Adding drugs without a diagnostic work up often worsens the problem because many drugs have undesirable side effects and can adversely affect water quality. The beginning hobbyist (and if truth be told, even the advanced hobbyist) is best served by consulting a fish health specialist to properly diagnose the disease, help identify any other predisposing factors, and recommend the proper treatment. Check our Tech Tip on finding a veterinarian who specializes in treating fish. Dr. Roy Yanong, Extension Veterinarian at the University of Florida’s Tropical Aquaculture Laboratory in Ruskin contributed greatly to this article.